LAHORE: (Saturday, November 10, 2018): Punjab Governor Chaudhry Muhammad Sarwar has said that there will be zero political interference in appointment of vice chancellors and deans at universities because the government believes in merit and transparency. He said that the government would extend full support to the universities for improving their international ranking. 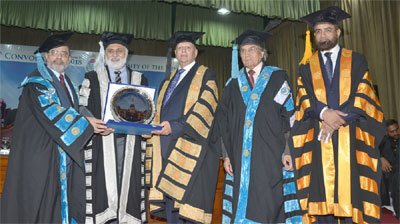 He was addressing Punjab University’s second phase of 126th Convocation at Faisal Auditorium here on Saturday. On this occasion Chairman Punjab Higher Education Commission Prof Dr Muhammad Nizamuddin, PU Vice Chancellor Prof Niaz Ahmad Akhter, Acting Controller of Examinations Rauf Nawaz, Registrar Dr Muhammad Khalid Khan, Additional Controller Raja Shahid Javed, Syndicate and Senate’s members, deans of various faculties, professors and a large number of MPhil/Phd scholars and their parents were present. 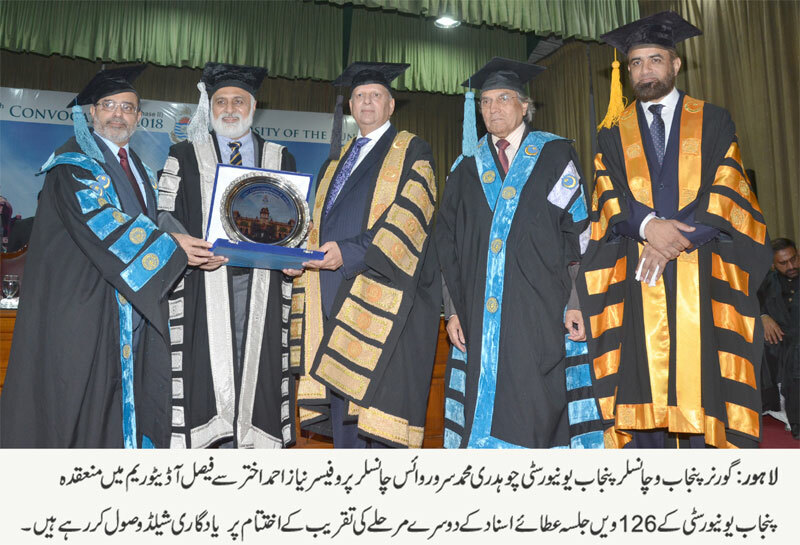 Addressing the ceremony, Mr Sarwar said that the principles of merit, transparency and accountability must be followed for improving international ranking of the universities. He said that Prime Minister Imran Khan and his team considered youth as the most valuable asset of Pakistan. He said that the government had high expectations from them and the youth was our real power. He said that equipping youth with education was the top priority of the government. The Governor said that the nations who spent their energies on education found respect and were ruling the world. He said that the power, wealth and designations which could not serve humanity were useless. He said that the government believes in right person for the right job. He advised the students to give maximum respect to their parents because it was their efforts and prayers due to which they had achieved excellence in their career. He said that the students must not feel bad while doing labor work as it was source of respect for them. Remembering his past, Mr Sarwar said that when he resigned from governorship in 2013, he had deep regret that he could not participate in the convocation of the Punjab University. He said that PU was a great institution and he was proud of being PU’s Chancellor. He said that it was a matter of great pleasure for him that he had come to PU today. Addressing the ceremony, PU VC Prof Niaz Ahmad said that PU administration was making efforts to bring PU among top 400 universities in the world. He said that in a few time period, the government had organized meetings of all statutory bodies and Senate’s meeting was held after 11 years for smooth functioning of university affairs. He said that in five months, the university had promoted faculty members who were awaiting their promotions since many years and new appointments had been made 100 percent on merit. He said that the administration was also focusing on training of teachers and staff and curriculum was being designed on modern lines. He said that the administration had appointed heads of departments on seniority basis and for the first time, one man one post policy was being implemented. He said that the university had recently improved ranking in Asian universities 39 times and now it is amongst top 200 Asian universities for the first time. He said that next year, PU’s ranking would improve further. Congratulating the students, he advised them to keep themselves up-to-date in their relevant fields. He said that the government had taken 313 kanals of PU land for construction of road but no money was given to the university in compensation. He said that if the government provide money or alternative land in compensation, PU would provide state-of-the-art medical college and teaching hospital in return. In convocation, 103 PhD and 1051 M Phil degrees were distributed among students while 25 medals and 7 cash prizes were also distributed among M Phil students.